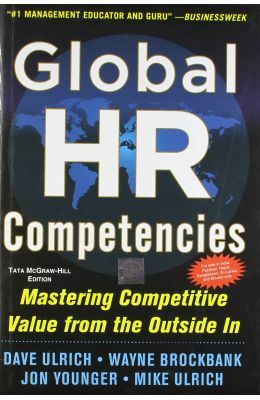 From legendary HR authority and bestselling author DaveUlrich(The Why of Work: 43,000 copies/WSJ bestseller andHRTransformation: 20,000 copies) comes a global review ofHRcompetencies that offers a general overview of the developingstateof the practice and then goes into detail on how thesecompetenciesare being adapted in each part of the world. Thechapters will beabout HR current practices in Asia, Australia,China, Europe,India, Latin America, Middle East, United States. HR thought leader Dave Ulrichbestselling author of HRChampions,The Why of Work, HR From the Outside In, and moreis backwith hisinternational colleagues to unpack and distill the finest,mostup-to-the-moment thinking from the HR world. Indeed, thisbooklooks at best practices from companies on every continent,offeringan experts survey of universal and regional HR dos anddonts. How to best employ, develop, and make the most ofHRprofessionals, giving you and your organization themaximumAdvantage wherever you are in the world. Chapter 13: Future of Global HR: Whats Next? Dave Ulrich is a professor at the Ross School ofBusiness,University of Michigan, a partner at The RBL Group, andexecutivedirector of The RBL Institute. Wayne Brockbank is a clinical professor of business attheUniversity of Michigans Ross School of Business and anemerituspartner in The RBL Group. Jon Younger is a partner of The RBL Group, leads thefirmsstrategic HR practice, and is a director of The RBLInstitute. Mike Ulrich is a PhD student at the Moore School ofBusiness,University of South Carolina, with a background inresearch methodsand statistical analysis.